Poison Spyder JK Body Armor is recommended equipment for any JK venturing into off road situations where body damage is eminent. 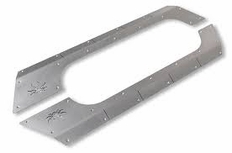 JK Body Armor protects the thin factory sheetmetal with rugged, precision-fit 3/16" plate steel. Steel is preferred where the JK Body Armor will be installed by itself, without Rocker Knockers� or other rocker panel protection. Used by itself, JK Body Armor hugs the Jeep's body contours to provide protection with no loss of ground clearance. Used with the factory Rubicon rocker rails, the JK Body Armor helps prevent trail damage that can be caused by rocks pushing the factory rocker rails up into the body. And used with Poison Spyder's JK Rocker Knockers�, the JK Body Armor provides one more line of defense for your JK, in the most complete, strongest, best looking package of rocker panel protection gear available for the JK. JK Body Armor is manufactured from either 3/16" high pressure steel plate or 3/16" 6061-T6 aluminum plate. Steel is preferred where the JK Body Armor will be installed by itself, without Rocker Knockers� or other rocker panel protection. Aluminum is recommended where Rocker Knockers, the stock Rubicon rocker rails or other rocker panel protection will also be used. The aluminum pieces are much lighter weight (27 lbs. lighter for the 4-door versions), yet still provide excellent load distribution characteristics when used as a secondary barrier in conjunction with external rocker rails. Both steel and aluminum versions may be painted or powdercoated prior to installation, but only the aluminum ones may be installed raw without any protective coating. They may also be polished or clear-coated at the installer's discretion. Both steel and aluminum parts are CNC-laser cut and precision brake-formed for a precise fit to the unique contours of the JK body. Bolt holes are countersunk, and stainless steel flat head cap screws are supplied for a clean, flush-surface installation. Drilling of the body is required for installation. The part number for this item is Poison Spyder 17-08-410 and it fits 2007-2016 Jeep Wrangler (4 Door Models).